For the past decade, mental health clinicians in California have been leading an offensive campaign to increase patients’ access to timely care. 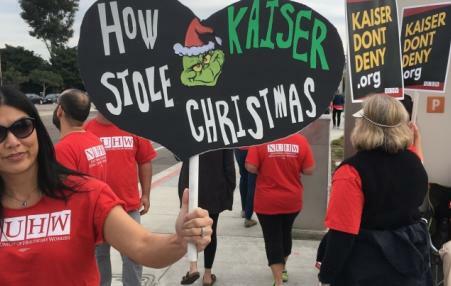 Will Kaiser's Labor Partnership Crack? It’s this year’s biggest private-sector bargaining, between the Kaiser Permanente system and a coalition of 28 locals representing 100,000 health care workers.But the national deal, due June 4, may reveal widening cracks in the celebrated labor-management partnership that turns 18 this year. Kaiser is looking for three concessions, say non-coalition unions: increased health care co-pays, cuts to retiree medical coverage, and a two-tier pension. Kaiser Permanentes 2,600 California mental health clinicians are on strike today, and we're staying out all week. 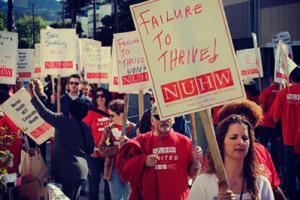 The National Union of Healthcare Workers (NUHW) will have a second chance at a representation election at Kaiser Permanente. 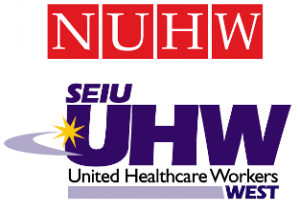 And it's because the National Labor Relations Board (NLRB) will be holding a revote of a 2010 representation election between NUHW and SEIU-UHW where the latter prevailed by violating the law and colluding with Kaiser to rig the vote. There is no nice way to say it. These are the facts.